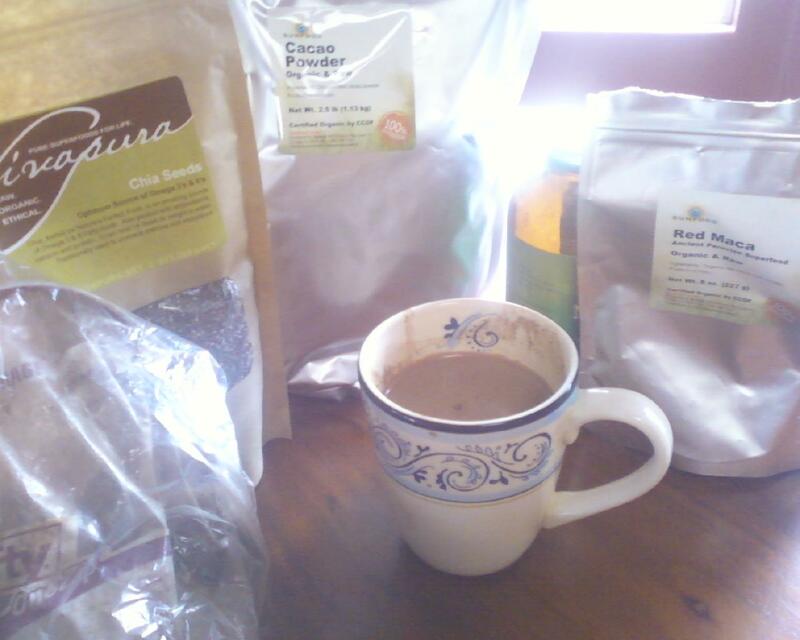 Raw vegan hot chocolate is an incredible treat for the holidays. It’s cozy, warming and wonderfully delicious. This morning, in the festive light of our home’s cute miniature (real!) Christmas tree, I whipped up a batch of delicious raw hot chocolate spiked with just about every “superfood” I had on hand. (P.S. If you haven’t already, definitely check out Gena Hamshaw’s take on superfoods. I really appreciate her perspectives on the topic!). I have grown fond of tossing a bunch of “super” ingredients into my recipes when I can. I hope you’ll enjoy this fun nutrient-dense hot chocolate recipe, featuring reishi mushrooms, raw cacao, chia seeds, maca, mesquite, and Vitamineral green. Toss all ingredients in a Vitamix or other blender. Mix until smooth. Meanwhile, heat up a pot of hot water. Add 2 cups hot water to the mixture and enjoy!